I quite liked Richard Boleslawski’s 1935 movie of Les Misérables starring Charles Laughton as Javert and Frederic March as Jean Valjean. Like the 1978 version it focuses heavily on Valjean vs. Javert, starting with Valjean’s trial. But you get just enough of the other characters like the students (and even the bishop) to make them seem real. It feels like their stories are intersecting instead of them just being part of Valjean’s background. March has strong presence as Valjean throughout, though the star is clearly Laughton. His Javert, rather than being stony, is nervous and has a bit of an inferiority complex due to his family background. It becomes the reason he’s such an overachiever and holds everyone, himself included, to an impossible standard, and when he slips, the cracks show quickly. He even helps lifting the cart, showing the heroic side that’s often left out. A refrain that links Valjean and Fantine: “Do you know what it’s like to be hungry and out of work?” In 1935, probably a big chunk of their audience did. Speaking of Fantine, one of the biggest changes to the story is that Valjean actually manages to get Cosette before Fantine dies. 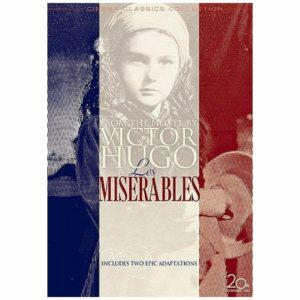 It’s the only version I’ve watched so far where Cosette sees her mom past the age of two. This also means there are a lot fewer secrets between her and her adoptive father. The students are basically Marius and his rabble-rousing pals. They make the point that they only want to reform the justice system, which I suppose keeps them thematically connected to Valjean, but is presented in an awkward, editorial-made-us-do-this way. Reducing the insurrection and barricade to a mere riot makes for the weakest part of the adaptation. On the other hand, having the heightened police presence in Valjean’s bolthole neighborhood heightens the tension nicely. Cosette and Marius actually spend time getting to know each other. It’s maybe a thirty-second montage of their dates, but it was nice to see them having a relationship instead of simply simply being struck by love at first sight. I had to wonder if they filmed and deleted more scenes with Cosette and Éponine. The Thénardiers barely appear even in the earlier segment, and Éponine isn’t named as a child that I can recall. Yet during the riots, when Éponine is acting as a messenger, Cosette recognizes her name. She doesn’t say or do anything about it, but you can watch the penny drop in what’s essentially an Easter egg for those who have read the book. This is another one where the story ends with Javert’s suicide, but unlike the 1998 version, it doesn’t feel abrupt or unearned as an ending. The reason is that Valjean has already said his tearful goodbyes to Cosette and a barely-conscious Marius. The DVD edition I watched is two-sided, and has the 1952 remake on the back. That one’s a decent film for its time, but I didn’t like it as much as this one. This entry was posted in Reviews and tagged Adaptation, Movie on December 4, 2016 by Kelson Vibber.